On a day hailed as significant for the future of Super League, it proved monumental for Dom Manfredi. 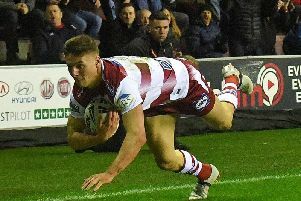 The winger marked his return after more than two years on the sidelines with a dazzling late double to add the gloss to Wigan's sixth straight win. And it saw them tighten their grip on second spot - rewarded with a home semi-final - by moving three points clear of Castleford with two games to go. Warriors held only a slender, nervy 8-6 advantage when Manfredi profited from a scorching break by Oliver Gildart to squeeze over. The reaction of his team-mates - and fans in the stands - showed just how much good-will there is for the winger, playing 762 days after his last senior match. And Manfredi went over again moments later as Wigan finished strong. His return was the main talking point in the build-up. He took his old right wing spot, with Tom Davies switching to the left to partner Dan Sarginson, who made his 100th appearance for the club. This was, incredibly, the fifth meeting between these sides this year, and fans were wondering whether this would be more like the Magic Weekend or the tragic Challenge Cup weekend. Certainly, the bookmakers favoured the hosts. Warrington, with no risk of dropping out the top-four, rested senior players Tyrone Roberts and Chris Hill while Kevin Brown and Ben Murdoch-Masila were among their injured players. But - with Zak Hardaker and Dave Whelan watching on from the directors' box - the early exchanges gave no indication they were simply treading water until the semis. It was a physical first-half but scrappy, too, which appeared to be heading to a stalemate until Thomas Leuluai crossed in the 38th minute. Manfredi made some early nerve-settling carries, reminding fans of his strength and and footwork. The game settled into an even exchange, with Tony Clubb trying his best to harass the Wolves' halfback pairing of Harvey Livett and Dec Patton and both sides guilty of being wasteful in possession. Clubb and Leuluai were among the shining lights in a defence-heavy game until the damn burst in the final 10 minutes. With the scoreline still blank midway through the first-half, Taulima Tautai was brought on for his first game since serving a four-match suspension. He joined a side on the ropes, temporarily, but they survived when Bodene Thompson was held up over the line. Moments later, Thompson was disciplined for an exchange with John Bateman which turned the volume up inside the DW. Stefan Ratchford went close to breaking the deadlock when he raced onto a reverse stabbed kick, but fumbled the ball under pressure from Tomkins. Wigan fired into life, using offloads to sweep down field and force a repeat set - only to release the pressure through Sam Powell's forward pass to Tautai. They had to wait for their next real opportunity, but that faded with a misplaced kick from George Williams. Wolves were not much better, Ratchford spilling a chance under little pressure - it was that kind of half. With two minutes before half-time, it needed the footballing skills of Bateman to break the deadlock, first punting the ball on and the dribbing it into the path of Leuluai. Tomkins tagged on the extras but, just before the hooter, sent a drop-goal attempt wide. Wigan weathered a storm early in the second-half before Clubb's return helped set the platform for an attack. But then came one of the game's major flashpoints. Tomkins, as captain, questioned Robert Hicks' decision to award Warrington a scrum - and replays suggested the full-back had a case. But the official penalised Tomkins and then, seconds later, sin-binned the No.1 for again speaking out of turn. Wolves quickly capitalised on their numerical advantage, Ratchford - like Tomkins, a St Pat's product - touched down for a try which Dec Patton converted. The score locked up, Williams booted a penalty to give Wigan an 8-6 lead heading into the final quarter before Tomkins returned. Tom Lineham's swinging arm on Manfredi sparked an all-in melee - and saw the Wolves winger yellow carded. Just as it appeared to be heading to a nervy final few minutes, Wigan cut loose, easing through the gears with Morgan Escare and Gildart taking the ball down field for Manfredi's first. He crossed again moments later as the Wolves wilted, before Ryan Sutton had the final say - both tries converted by Tomkins. Wigan: Tomkins; Manfredi, Gildart, Sarginson, Davies; Williams, Leuluai; Clubb, Powell, Navarrete, Bateman, Isa, Hamlin. Subs: Escare, Sutton, Partington, Tautai. Warrington: Ratchford; Lineham, Goodwin, Atkins, Charnley; Livett, Patton; King, Clark, Westwood, Thompson, King, Hughes. Subs: Philbin, Johnson, Smith, Pomeroy.